Immunocytochemistry as an investigative method is now as sensitive as radiometric, cell-free methods, and thus provides the opportunity of detecting hormones at their sites of action . Immunocytochemical demonstration of steroid receptors on cells and tissues is based on the detection of the steroid hormone bound to its own receptor by specific antibodies. 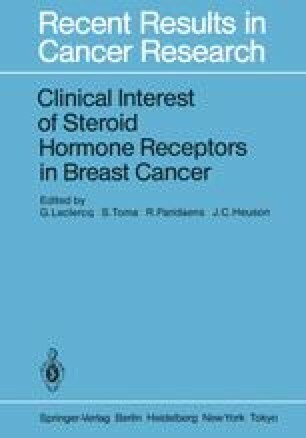 The aim of this contribution is first to report the authors’ and other workers’ experience and then to provide a critical evaluation of the advantages and limitations of immunocytochemistry of steroid receptors when applied to the problem of breast cancer.